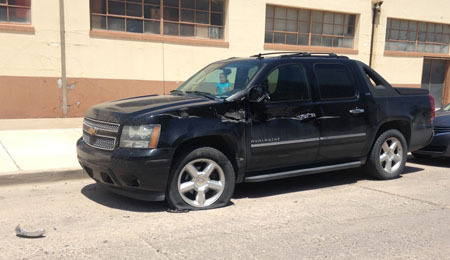 A black Chevrolet Avalanche sits heavily damaged after a delivery semi-truck struck it while attempting to reverse along Fifth Street between the Daily Press and Yates Petroleum this afternoon. The Avalanche sustained significant damage to its driver’s side, including a popped left-front tire. Its right-rear tire was pushed into the curb hard enough to damage the concrete.